Running drills on the track at Wendler. The ability to run 3 miles is recommended. We have runners of all speeds -- nobody is too fast or too slow!! Come twice for free to evaluate us and decide if you'd like to join! You can join any time throughout the season. See Calendar for times and locations. 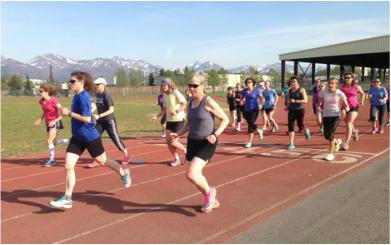 If you've decided you would like to join the team, please download our Release Form, fill it out, and bring it to a practice along with a check for $100 made out to "Exceed Women's Running Team." ...or find us on Facebook! Taking a break from the track with a group trail run.